We are in the middle of the holiday shopping season, many ecommerce retailers are focused on developing and implementing strategies that will help them boost sales on what has arguably become the most popular and most well-trusted online shopping store in the United States: Amazon. The numbers don’t lie: when people want to shop online, they turn to Amazon first. In 2015, BloomReach found that 44% of online shoppers go directly to Amazon to research a product—before checking any other site. That’s nearly half of online shoppers AND that study is already two years old. It’s likely that the percentage is even higher this year. NetElixir also predicts that Amazon’s share of holiday e-commerce sales will reach 34 percent this year, up from the 30 percent share it owned last year. As an ecommerce business owner, it’s up to you (or your agency) to understand how to best leverage the site to drive as many sales as you can before the end of the year. Not surprisingly, competition on Amazon is fierce. Brands are born and brands fizzle out every day on the site. In order to differentiate from competitors, boost product awareness, and attract your target customers, you have to leverage yourself and your brand as a resource. If you’re operating in an extremely saturated product category like fitness or kid’s toys, you have to help online consumers understand what makes you and your products better than everyone else’s—this is especially if you know that your audience can easily find similar products on Amazon that are cheaper to buy than yours. Step 1: Think about the value you can provide to others. What questions can you answer for people who are searching for help? How can you create content that educates people and aligns with the passions or hobbies that they care about? Step 2: Create a place to publish and share that value. Set up a blog on your website and start sharing your value in the form of blog posts. If you need blog post ideas, start by making a list of the most frequently asked questions that you get from people relating to your industry—not your products! For example, if you sell running shoes, write a blog post that helps people understand how to stretch before and after a long run. Step 3: Start sending traffic to your original content. Work to send traffic to your new content by running Facebook ads, targeting keyword opportunities, and sharing your content with your social media communities. Step 4: Capture email addresses and start nurturing leads through email marketing campaigns. Don’t let the traffic you do receive go to waste. Put the tools and automation in place to capture email addresses, and build content-focused email drips that continue educating leads and nurturing them down your funnel. Step 4: Include compelling CTA’s throughout your blog posts and emails. Create compelling call-to-action messages and buttons within your content that send people directly to your product listings and brand page on Amazon. Online consumers spend a lot of time researching before they make any purchasing decisions. By positioning yourself as a valuable and trusted resource in your industry, you’ll have a much easier time capturing the attention of your target audience, and persuading them to buy from you on Amazon, rather than from your competitors. Another way to boost sales on Amazon is to get help from well-known influencers in your industry. As mentioned above, online consumers spend a lot of time researching about products and brands before they decide whether or not to buy from them. They also rely heavily on reviews from friends and strangers, as well as recommendations from social media influencers and celebrities. To boost sales this holiday season, consider partnering with a handful of influencers who have large followings on Instagram, Snapchat, YouTube, Pinterest, or Facebook who can help you tap into new audiences. Route #1: You can work with influencers through using the Amazon Associates or Amazon Influencer Programs. Route #3: You can connect with influencers on different social media channels using influencer network tools like Shoutcart, grapevine, or Famebit. According to nChannel, 88% of consumers say that they trust online reviews as much as personal recommendations. Partnering with the right influencers is another way for you to intentionally influence the opinions and actions of your target audience. As with many other channels, you can find more success on Amazon if you’re willing and able to pay to play. Having a well-optimized product listing is great, competitively pricing your products helps a lot, but none of it matters if your target audience is noticing products sold by your competitors instead of products sold by you. Creating Sponsored Product ads on Amazon can help you cut through the noise. Here’s how it works: you choose the products you want to advertise, how much you are willing to spend, and keywords that you’d like to target. According to Amazon, based on relevance and bid, ads are shown to customers with matching search terms. Ads appear in high-visibility spots like page 1 of search results and product detail pages. In order to be eligible to create and launch Sponsored Product ads on Amazon, you must have an active professional seller account, be able to ship to all US addresses, and the products you advertise with Sponsored Products must be eligible for the Buy Box. Want help getting started? Check out this fantastic guide from KlientBoost. It will teach you everything you need to know about creating and launching winning Sponsored Product ad campaigns on Amazon. Online reviews are an important factor for online consumers. A good review can fuel sales for days for your business, and a bad review—it only takes one—can negatively impact sales for months. When it comes to selling on Amazon, reviews matter just as much as they do on your own website. To drive more sales over the next few months, you need to have a strategy for getting more of your customers to leave authentic and helpful reviews on your product listing pages. Your goal is not to influence what is said in the reviews (i.e. you are not paying for praise), instead, your goal is to simply invite people to participate in the discussion. Idea #1: Follow up with customers via email. After you have received notification that your product was delivered to its intended recipient, follow up over email and ask if they’d be willing to write a review about your product on the Amazon listing page. This is where you can pull at the heartstrings a bit and explain more about how you stay in business, compete with other companies, connect with more customers, etc. Idea #2: Include a note in the package you send your products in. You can also include a handwritten note in your package that thanks customers for their business, and asks them to write a review about your product on the Amazon listing page. It’s a small gesture, but you’ll find that people respond quite positively to handwritten notes. Idea #3: Remind people on social media. Every so often, invite your social media followers to review your products on Amazon. Don’t offer any incentives, just explain why reviews matter, and why you’re asking for help. Transparency is what will make this tactic successful for you, so just be honest and open with people. Remember: you cannot and should not pay people to write positive reviews about your products on Amazon. You also can’t give products away to people for free and, in exchange, require them to give a positive review about your products. In order to put your products in front of more people, you need to make sure your listings are optimized for search. It’s similar to the exercise and effort that you have to put into optimizing your website and product pages for Google. When your listings are optimized, your products show up higher in search results. Your goal is to show up as close to the top as possible when your target customer is searching for keywords that relate to your products. When it comes to Amazon search optimization, there is a lot to learn. If you’ve never made any attempt to optimize your listings before, or if you aren’t sure where to start, the best thing you can do is spend some time diving into some meatier blog posts on the subject. Once you’ve spent some time learning about Amazon search optimization, start working intentionally to update some or all of your product listings. Make sure to make note of performance before you make any changes—you want to be able to track progress and success along the way. Be transparent: First and foremost, you should go out of your way to be transparent with your current and future customers. They should never have to guess about the quality of your products, how they were made or manufactured, what your shipping and return policies are, etc. Help your customers feel like they know and can trust you as a brand. Invest in customer delight: Go out of your way to wow your customers during the buying process. Include handwritten thank you letters in the packages you send, engage with customers on social media, send personalized email follow-ups, add bonus products in packages that are being sent to your best customers, etc. Follow up personally: Don’t make your customers feel like they are interacting with a robot. It’s OK to use marketing automation to engage with people after they buy, but it’s important to take time to customize and personalize each email you send out. Your goal is to nurture a relationship with your customer in hopes that they will spread the word about your brand and products, or even buy from you again in the near future. Share your story: Help people understand who you are and why your business exists. Share stories about your products, your partners, the manufacturing process, your employees, etc. to build trust and excitement with your target audience. Remember: your goal is to avoid having to compete with other businesses on price alone. Instead, compete by creating unforgettable experiences for every individual who buys a product from you. If people are visiting your listing pages but not buying, it could be because your copywriting and language is not compelling enough to get people to take action. If you haven’t updated your product descriptions more than once since launching your listing page on Amazon, it might be time to take a closer look, as a few simple changes could dramatically increase sales in a relatively short amount of time. A word of caution: try not to change too much at once. Start small by testing different words in your headings and body, but don’t completely re-write your product description. Doing so could actually have the opposite effect on your sales. Companies that incorporate videos in their marketing strategy experience a 27% higher CTR and a 34% higher web conversion rates than those that don’t. 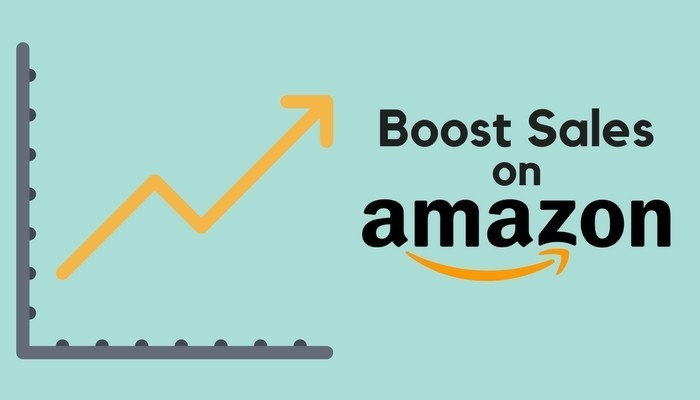 To boost sales on Amazon, create original videos and share them on your website, social media channels, and in your email campaigns. Embed call-to-action messaging and links that send viewers directly to your product listing pages on Amazon. Need video ideas? Spend time going through the post I mentioned. In it, I share a handful of ideas and real examples from other ecommerce brands. Finally, the best way to boost sales on Amazon is to figure out which of your products are selling best, and double down on them. If you’re struggling to gain traction, try reducing the number of items you’re selling, and create a more targeted marketing strategy that you can use for just a few of your products. If you start seeing the kind of numbers you’re looking for after executing on your strategy, you can slowly introduce more items again and develop new strategies based on what you’ve learned along the way.